When Colony Collapse Disorder was detected in 2007, researchers immediately started searching for causes of the massive honey bee die-offs. They also looked at other species of bees to see if they were being affected as well, and they found that several species of bumblebees are also declining. We now know that honey bee and native bee populations are declining as a result of a combination of factors including habitat loss, nutritional problems, pesticides in the environment, and increasingly virulent pathogens. A large-scale study of bumblebees in Europe and North America concludes the effects of global warming as also being significant contributors to bee losses. The study described in The New York Times, http://www.nytimes.com/2015/07/10/science/bumblebees-global-warming-shrinking-habitats.html, traces 420,000 observations of 67 species of bumblebees over 110 years. The researchers analyzed bumblebee observations for every year from 1900 through 2010, recording the geographic range of each species. They found that bumblebee ranges declined at “continental scales” in the years following 1974 when human-caused climate change increased at a significant rate. With temperatures rising by two degrees Celsius since 1974, the southern limits of bumblebee ranges retreated toward the north at a rate of about three miles per year. One species of bumblebee once found in North Carolina and the Mid-Atlantic is now found in Maine, New Hampshire, Ontario, and Quebec. Another bumblebee once found in Georgia is now found in small numbers in Illinois, Maine, and Wisconsin. The researchers were surprised to find that bumblebee ranges didn’t merely move northward; the areas shrunk. The northern borders of the bumblebees’ ranges didn’t move into new territories. As climate changes occur in temperate regions, like Europe and North America, species relationships are changed. Timings of flower blooming may result in a dearth of food for bees at critical times. Some species can’t tolerate changes in climate heat. 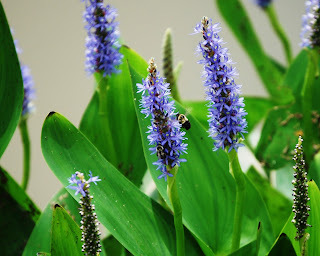 In today’s photo, we see bumblebees foraging pickerelweed flowers along an Arkansas waterway. The native pickerelweed is an efficient biological filter of polluted water. A person managing a number of bee hives often finds the total number of hives holding live bees varies throughout the year. Typically, beekeepers combine colonies into fewer hives in the fall in preparation for winter. Then, in the spring, they make colony divisions from strong surviving colonies to occupy a greater number of hives. Throughout the year, hive numbers may increase or decrease as the beekeeper purchases colonies, captures swarms, or colonies die. There are occasions during the year when it is very useful for the beekeeper to record the number of active hives in the various bee yards. Counting the number of hives in the fall that are prepared for winter and later, in the spring, counting the number of hives surviving the winter gives the beekeeper a measure of over-winter losses. An important measure of honey yield involves counting the number of full-size hives in place during the major nectar flows. To calculate the honey yield per hive, the beekeeper simply divides the number of pounds of harvested honey by the number of full-size hives at nectar-flow time. In the Arkansas Delta, Independence Day, July 4, is a good time to count hives, as this date falls within a major nectar flow of the region’s two major nectar sources, soybeans and cotton. By measuring the honey yield per hive of different bee yards, the beekeeper can determine which areas are the better producing ones. Yields will often vary widely from year to year as crop plantings are rotated. 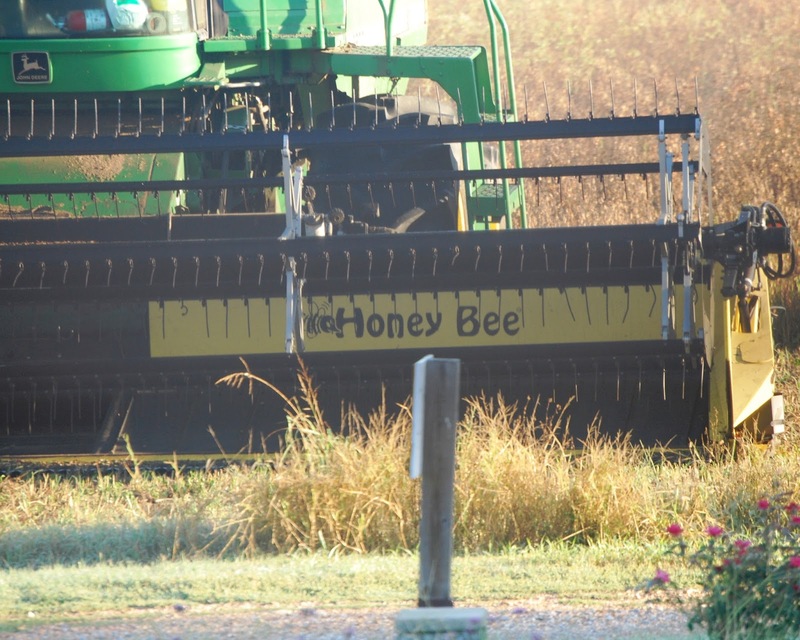 Bee yards in proximity to soybeans and cotton may produce an abundance of honey in one year; however, if the near-by fields are planted the next year with corn, wheat, rice, or sorghum—crops that produce no nectar—honey yields may be greatly reduced. Bee yards with a history of poor honey production may need to be abandoned for more productive sites. In today’s photo, Arkansas Delta farmers prepare a grain combine equipped with a Honey Bee model header.